It is defined as, "The quantity of water required by a crop in a given period of time for normal growth under field conditions." It includes evaporation and other unavoidable wastes. Usually water requirement for crop is expressed in water depth per unit area. The first thing you need to consider when planning your garden is what growing zone you live in. This is based on both the temperature range of your climate and the amount of precipitation. Take a close look at the area in which you are going to plant your garden. If the ground tends to be very moist, choose plants that can tolerate constantly wet soil, and even standing water. If you live in an area that suffers from frequent droughts, however, select plants that can tolerate going long periods without water, especially in light of the frequent watering restrictions imposed on such areas. If you are lucky enough to live in an area that has a balanced climate, you have a wider range of choices for your plants. Plants that require low levels of water are often called drought tolerant. Drought-tolerant plants can thrive in hot, dry conditions with very little water. They include both perennials and annuals. Most drought-tolerant plants only have to be hand-watered when they are planted and while they are establishing themselves. After that, they can be left to the natural cycle of the elements. Popular drought tolerant trees include the red cedar. live oak, crape myrtle, and the windmill and saw palmetto palm trees. All citrus trees are also drought tolerant. Many homeowners in areas prone to drought, such as parts of the southern United States, use shrubs and ground covering vines as part of their landscaping. These include Texas sage, orange jasmine and Chinese fountain grass. There are not many perennial drought-tolerant plants, but amaryllis is one that is very popular, along with the African iris. Popular drought-tolerant annuals include marigold, cosmos and the Dahlberg daisy. 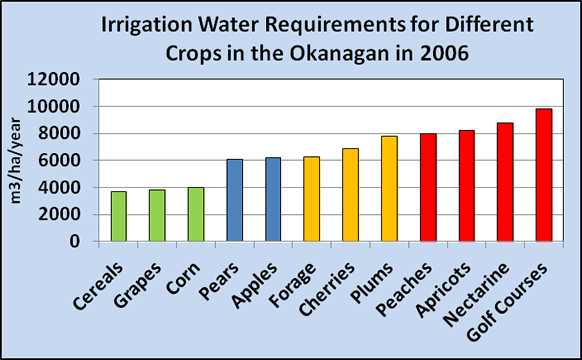 In this exercise, the irrigation water requirement is calculated for a 10-day period during the harvest stage. The percolation table is joined with the cross table to get the percolation for each soil texture class in each block. The amount of water loss for each soil texture class per block is calculated with a tabcalc statement. In order to get the total percolation loss per block the results of the previous operation are aggregated. Conveyance losses are calculated in about the same way as the percolation losses. First, the map with the irrigation blocks is crossed with the channel distribution map. The conveyance loss per meter channel length differs per channel type and is 0.2 m³ per day for clay channels and 0.01 m³ per day for concrete channels. A new table indicating water loss per channel type is created and joined to the cross table. The amount of water loss for each type of channel per block is calculated with a simple tabcalc formula. Finally the results are aggregated to evaluate the total conveyance loss per irrigation block. 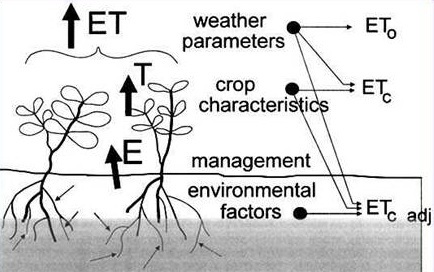 Crop water requirements are normally expressed by the rate of evapotranspiration (ET). The evaporative demand can be expressed as the reference crop evapotranspiration (ETo) which predicts the effect of climate on the level of crop evapotranspiration. In this case study the ETo is 8 mm/day. Empirically-determined crop coefficients (kc) can be used to relate ETo to maximum crop evapotranspiration (ETm) when water supply fully meets the water requirement of the crop. The value of kc varies with crop and development stage. The kc values for each crop and development stage are available in a table. Maximum evapo-transpiration refers to conditions when water is adequate for unrestricted growth and development under optimum agronomic and irrigation management. Maximum evapotranspiration is calculated in this case study by crossing the irrigation block map with the map that shows the different crop types in the command area, joining the cross table with the kc table and by applying the maximum evapotranspiration formula with a tabcalc statement. 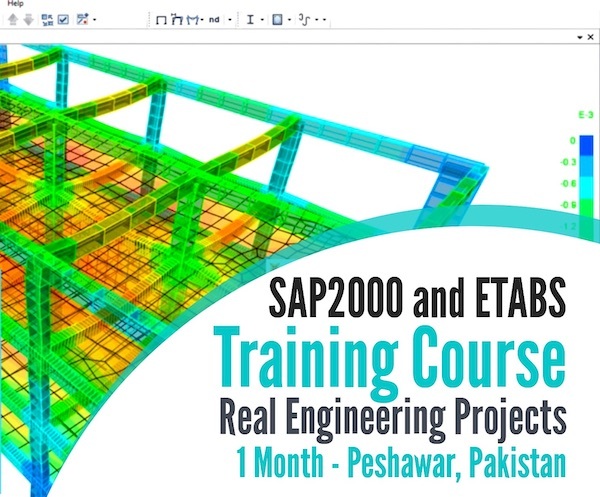 Finally, you will create a script to automate the calculation procedure. With the script, you can easily calculate the water requirements for other growing stages.